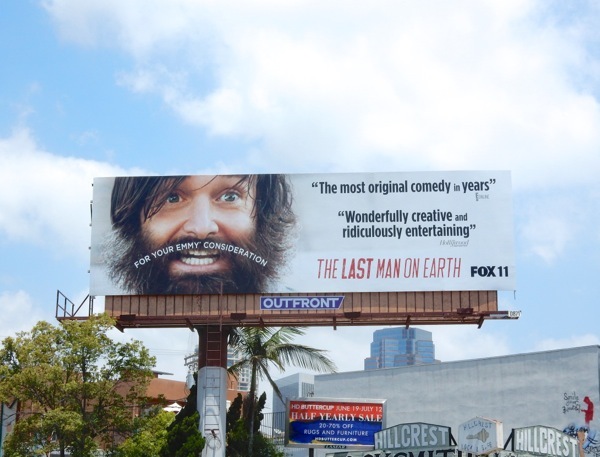 Fox seems to have captured lightning in a bottle this season with their ratings winning hip-hop drama, Empire, so let's see if they do it again with their new show, The Last Man On Earth. 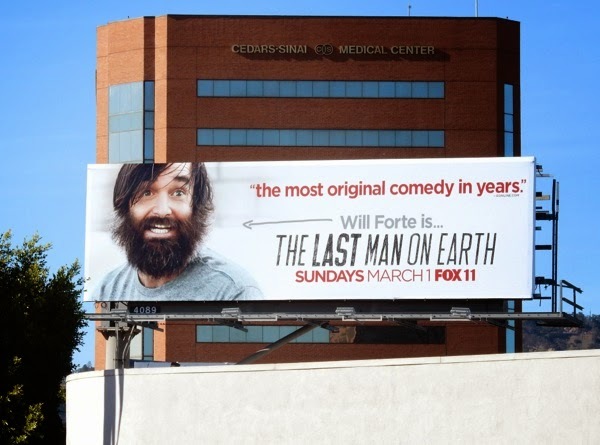 Will Forte stars in this end-of-the-world comedy where it seems the entire population of the Earth has been wiped out by some event in the future and 'Phil Miller' searches for any sign of life without anyone telling him what he can and can't do. 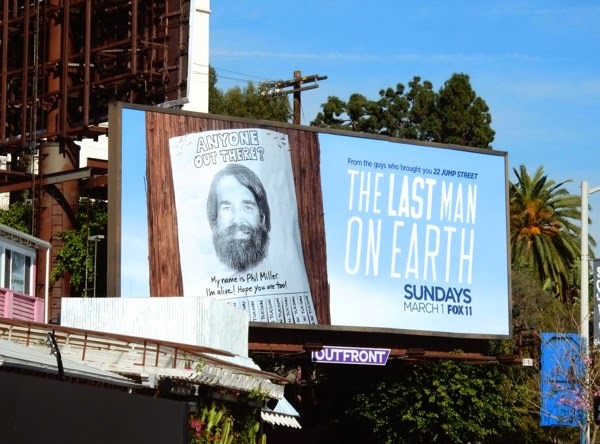 This series premiere billboard with its fun telegraph pole ad creative was spotted along Sunset Boulevard in West Hollywood on February 2, 2015. It may be a lonely life, but just imagine the possibilities of what mischief you could get up to. 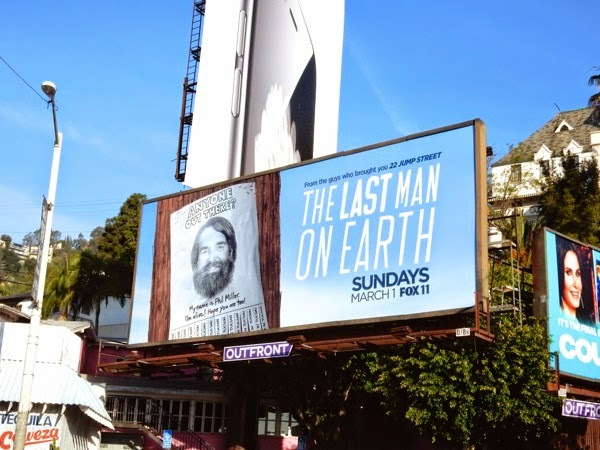 What would you do if you were the last person on Earth? 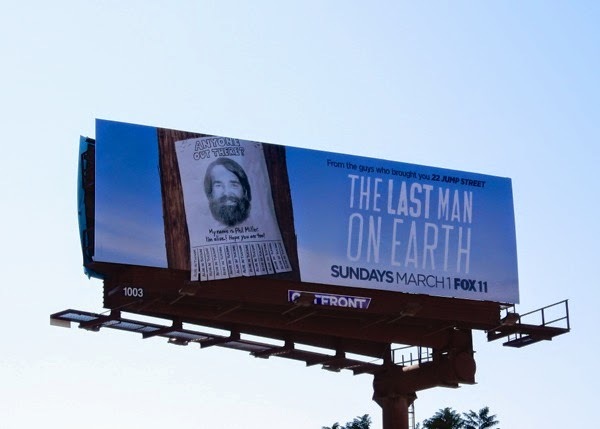 UPDATED: Here's also a special extension version which subtly takes the tear-away number poster one step further at the bottom of the billboard, snapped at Hollywood & Highland on February 8, 2015. 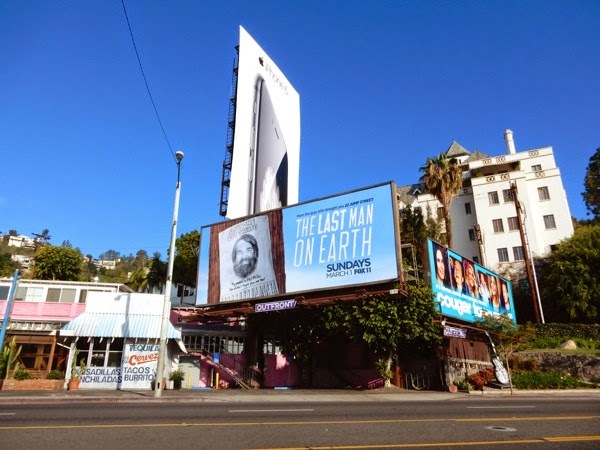 Plus another standard landscape billboard photographed along Beverly Boulevard the same day. 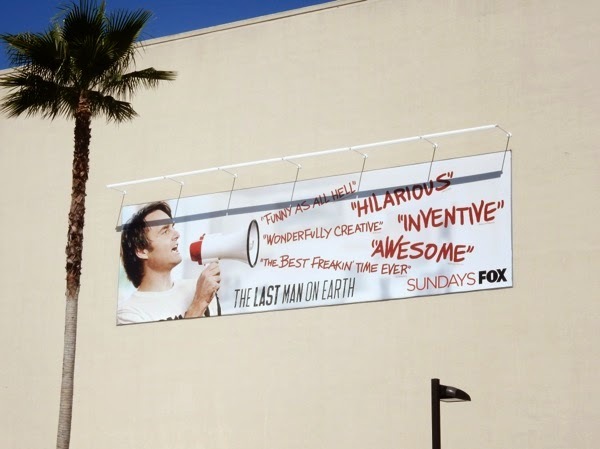 In addition here's another ad creative for the freshman series, snapped along San Vicente Boulevard on February 24, 2015, explicitly explaining that this new show is a comedy and letting everyone know how good it is. 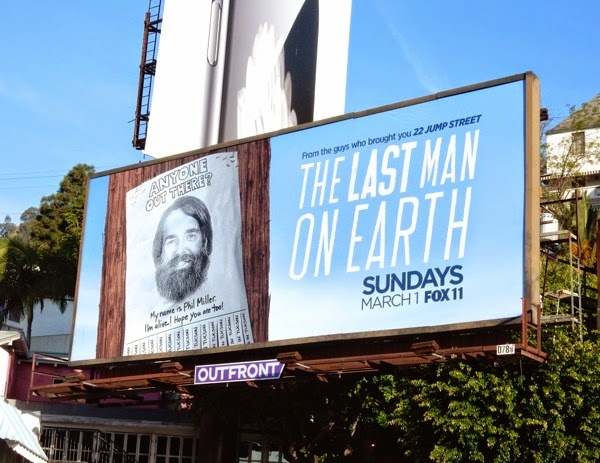 UPDATED: Here's a different self-promoting creative for the freshman TV series, featuring a clean-shaven Will Forte, spied on the side of the Fox Studios building along Pico Boulevard on April 4, 2015. 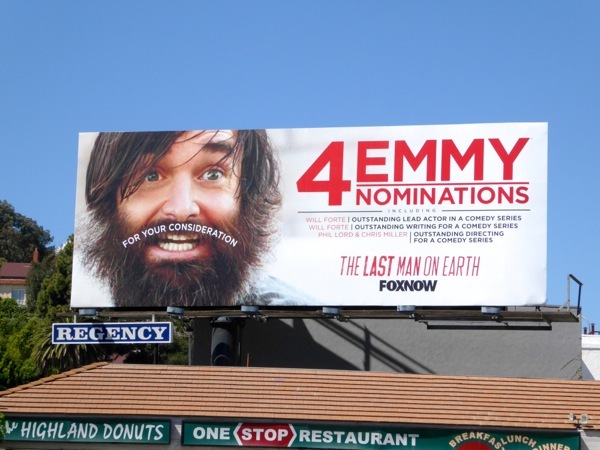 UPDATED: Here's also Will Forte sporting an Emmy moustache to get TV academy voters to consider The Last Man On Earth for an industry award or two this season, spied along Pico Boulevard on June 5, 2015. 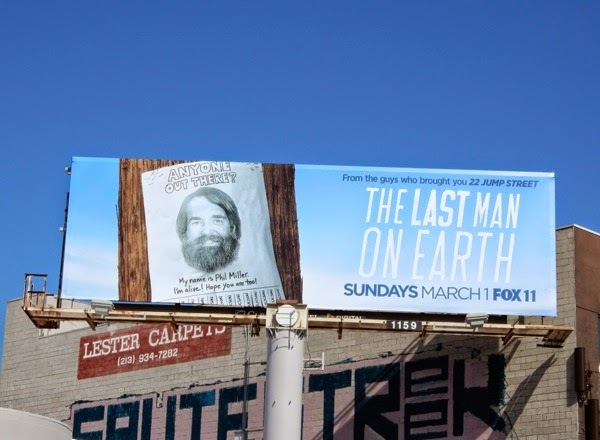 UPDATED: Will Forte may have been The Last Man on Earth this year, but that doesn't mean his luck has totally run out as the rookie comedy has been nominated for several Emmys, including Outstanding Lead Actor and Outstanding Writing. 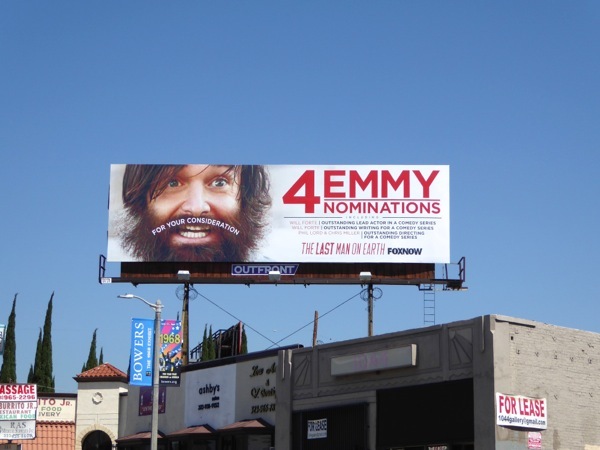 Let's see if these updated Emmy nomination billboards spied along La Brea Avenue on August 12 and along Highland Avenue on August 15, 2015 will help him take home an award or two.